When starting to examine cults, one quickly realizes that their nature is to mainstream their teachings and leaders. Most importantly, their drive is to be accepted and affirmed as a legitimate Christian group. This quest for affirmation can be seen in the New Order of the Latter Rain cult. The NOLR were thrilled to be embraced as a legitimate group through their Charismatic Movement in the early 1960s. In 1967 and later again in 1977, they were also happy to be affirmed by Roman Catholics . 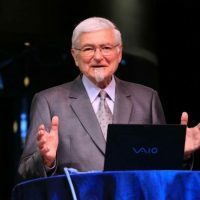 C. Peter Wagner has often written about the rise of the New Apostolic Reformation that was emerging from the Charismatic Movement, he himself acknowledging the roots stemming back to the NOLR. Below, we have a quote from a section of his book ‘Apostles Today’ that has him teaching on the difference between the ‘apostolic gift and the apostolic office’ then proceeds to teach people how to recognize NAR apostles.